On October 25 1954, in Col Cerasa de Cingoli (Macerata, Italy), two children, 12 year-olds Marziano Giampieri and Pacifico Santucci, were guarding a flock of sheep in a meadow near Mount Sgaggia. About 17:00 pm, they went to buy a sandwich, and upon returning, they were surprised to find the animals a little further from where they had left them, and the dogs were barking furiously. As they neared the place, Giampieri observed "something" moving through the high weeds which he thought they were animals, but about 10 feet away, he saw that it was a small, thin “thing” about 30/40 centimeters tall, of human appearance, but with a large melon-shaped head. It wore dark, tight-fitting clothes with a metallic sheen. It moved in a very clumsy way. Giampieri did not know if the odd shape of the head was because it wore a flattened helmet. 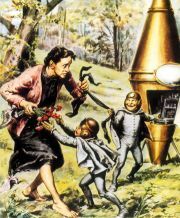 The tiny humanoid started running towards a strange dark object, shaped like a barrel, 1.50 meters long and 70 centimeters wide, which at one end had something like "antennae.” The object quickly rose vertically, emitting a low whistle. Going up about 20 meters, the "flying barrel" ejected a ball of fire, which exploded when it hit the ground. The two children were hit by a violent gust of wind caused by the shockwave of the explosion. The object disappeared at high speed, heading east. The youths fled in fear. That same day, a neighbor in the area, Maria Ruggeri, confirmed she had seen a strange flying object pass over her head.Police in Crawley and San Severino Marche, investigated the incident. Forensic experts were sent from Naples and the current president of the Scientific Association "Bilancia” Ancona, Mr. Andrea Quintini, interviewed the children. 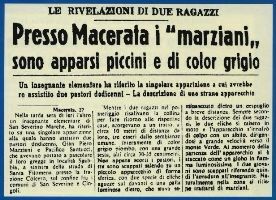 The newspaper "La Nazzione" on October 28, 1954, offered a version of the events recounted by a professor at College of San Severino Merche. In its pages, readers discovered that the strange encounter took place near the village of Santa Filomena Colcero on the border between the municipalities of San Severino and Cingoli. While the two boys were back home, they saw, about 10 meters distance from them, three small beings with big heads, fully dressed in gray with heights of about 30-35 cm. As soon as the shepherds saw the humanoids, they (the three beings) escaped, climbing into a small shining object of spherical shape, with two kinds of propellers on the front. This shows a distortion in the shape and sizes of the elements which contribute to the close encounter, depending upon the witnesses. Obviously, the noted 1954 incident of Mrs. Rosa Lotti Dainelli, by virtue of her being an adult, contains more details and complexity compared to the simplicity of the cases experienced by the young children. According to the description of the two boys, the two propellers were set in motion and the apparatus raised up, making a hissing sound at high speed, disappearing in the direction of Monte Verde. At the time of takeoff, the object, expelled a burning balloon. The two boys recounted the encounter to their teacher. 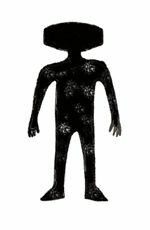 The incident of Macerata has many factors in common with other small humanoid sightings in 1953/54 (Villares del Saz; Spain and Cennina; Italy), where the observed objects are very similar.